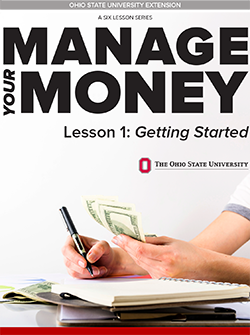 Ohio State University Extension Family and Consumer Sciences' Manage Your Money lessons use activities, goals and worksheets to help you plan for your financial future. While it is difficult to think about planning for the future when money is tight, learning basic money management skills will strengthen your independence, give you peace of mind, and improve your future financial security. This six-lesson series is about learning to better manage money. These lessons will equip you with the basic tools and skills to become financially stable. The material often refers to a two-adult household but can be adapted for a larger household, or for a single person.